1) Measure your wrist size with a flexible tape measure just below wrist bone, where you would normally wear your bracelet. 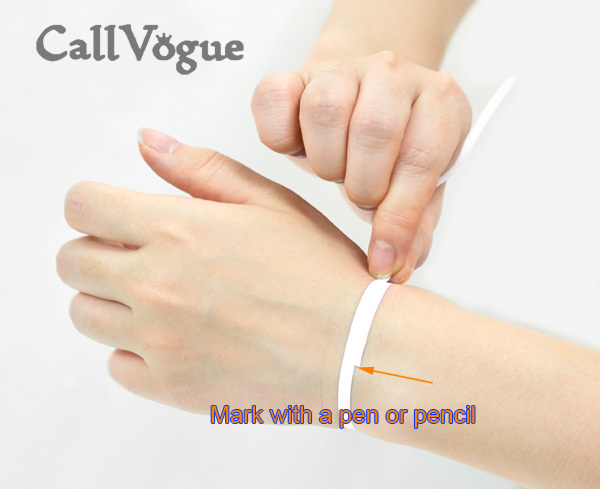 2) You can wrap a plain thin strip of paper around your wrist just below the wrist bone, Mark with a pen or pencil where the paper overlaps on your wrist. Measure the strip of paper with a ruler. * The option “Length” is total length of bracelet (End to End). – 8~10 mm bead bracelet : We recommend 2cm more bigger than your wrist size. – 6 mm bead bracelet : We recommend 1~1.5cm more bigger than your wrist size. – Braided Leather bracelet with Charm holder : We recommend 2~3cm more bigger than your wrist size. *It depends on your style which mean someone want to fit tightly or loosely. Please do not hesitate to Contact Us if any questions.